Rely on TECHTIGER to design your corporate identity, branding and graphics for use in digital and printed media. We design logos, infographics, banners, PDFs, brochures, reports, leaderboard and skyscraper style advertisements. Portray your brand, services and products in a range of static or animated formats. Contact us today with your design brief. TechTiger, expertise in graphic design Perth. Generate brand awareness and weave your unique value proposition into visually appealing material that empower your customers. Push ahead of your direct competitors with a newly created visual identity and collateral that exudes industry leading professionalism. Good design looks the part, but excellent design communicates with authority. Convey your brand message, values and benefits with purpose. Amazing design is easily recognised and remembered. 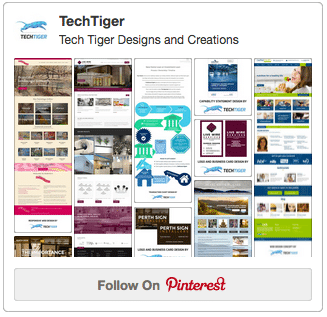 TECHTIGER designs create memorable first impressions and lasting impact. Drive customer satisfaction by providing an extra support medium. Fast-track customer engagement, while you build business. Whether it’s infographics, social media advertisements, annual reports or even business cards, we design for digital and print! TECHTIGER live and breathe amazing design. Look no further, contact us now for a chat about presenting your brand with an unmatched graphical flair. For examples of our graphic design work, please follow us on Instagram and Pinterest. The widget on the right will link you directly through to our Pinterest portfolio, which contains full branding / corporate identity kits for small Western Australia businesses. A classic example is Live Wire Services. This project included logo concept creation, refinements, business card design and subsequent transfer of these elements into online productions including the website. You can also view the project information in the TechTiger portfolio here. Again, contact us for a chat about presenting your brand with an unmatched graphical flair.